Thursday, September 12, 2013 at Camelot Theatres in Palm Springs. 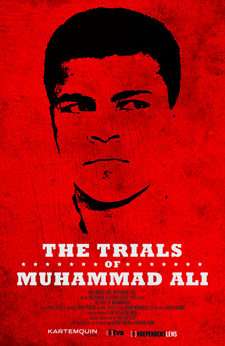 Directed by Academy Award–nominated director Bill Siegel, The Trials of Muhammad Ali, successfully chronicles Olympic Gold Medalist and World Heavyweight Champion boxer, Cassius Clay’s conversion to Islam, his decision to change his name to Muhammad Ali, and his subsequent refusal to serve in the Viet Nam war. It looks at Ali’s life, not so much as a boxer, but rather as a man on a spiritual quest that took him from being one of the most sought after men on earth, to being a social pariah, a convicted felon, and a political and religious target. Then, in a series of events that surprised not only the world, but at times, Ali himself, he was cleared of criminal charges by the US Supreme Court, became the first and only three-time lineal World Heavyweight Champion, and, eventually, the recipient of the Presidential Medal of Freedom. 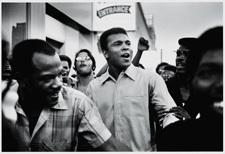 The Trials of Muhammad Ali includes never-before-seen historical footage of Ali, his family, friends and fans, his enemies and detractors, as well as interviews shot exclusively for the film, with Ali’s brother, Rahaman; his second wife, Khalilah Camacho-Ali; New York Times writer, Robert Lipsyte; and Nation of Islam leader, Louis Farrakhan. What emerges is a mostly hidden history of Muhammad Ali, an opportunity for people all over the world to see how his journey toward a full spiritual embrace of Islam and through his humanitarian work around the world, challenges each of us to overcome today’s struggles with power, race, faith and identity. 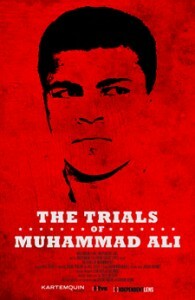 The Trials of Muhammad Ali is an amazing look at a man who is an integral part of America. A man who speaks his mind, and challenges convention with conviction. That man is Muhammad Ali.